One man from New York was traveling along Interstate 95 near Oakland Park, Florida, when a tire from a box truck flew off and struck the roof of his vehicle. The 25-year-old was killed in the incident. The Florida Highway Patrol says that the box truck suffered from catastrophic tire failure. The tire came loose, bounced over a concrete wall and slammed into the SUV’s roof. The cause of the tire failure is under investigation at this time. Although accidents like this aren’t common, they aren’t as rare as we may think. Truck drivers are required to inspect their vehicles regularly, but that still doesn’t keep these types of accidents from occurring entirely. If you or your loved one has been injured or killed as a result of tire failure, you may be eligible for compensation under a personal injury or wrongful death lawsuit. While it is possible for an entire wheel to come off, it is more likely that the truck will lose just the tire rather than the whole wheel. Sometimes they fall apart before they come off, and other times they come off in one piece. When this happens, it can send the tire or debris flying through the air. Tread Burn – This happens when the tread on the tire is used up or burnt. When this occurs, the friction from the road can cause tires to overheat and break into pieces that fly across the road and through the air. Under Inflation – When a tire hasn’t been inflated fully, the tire can become overheated and result in a blowout. Spare Tire – Because big trucks tend to go through so many tires, they often carry spare tires with them. 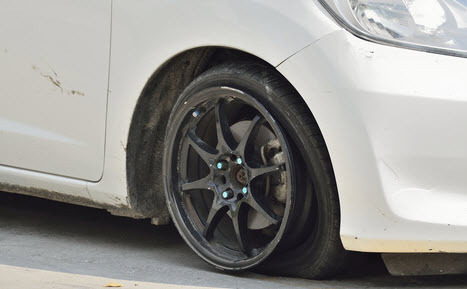 If the driver has to use a spare tire, that tire could be too old and rotten causing the tire to break apart and spread onto the roadway or other vehicles. Tread Separation – Even tires that seem to be in relatively good condition can have a blow out if the tread separates. This happens when the rubber and metal inside the tire disconnect from each other. The result is a tire that breaks into pieces and scatters across the roadway. Who Is Responsible for Accidents Caused by Tire Failure? Truck Owner – If the truck is owned by another party and they fail to maintain the tires or replace the worn tires when needed they could be liable for the resulting injuries and damages. Truck Driver – If the driver of the truck failed to maintain and inspect the tires on their truck, they may be responsible for any injuries or damages caused by their negligence. Tire Manufacturer – In certain situations, it may be the manufacturer of the tire that has created a defective product and caused the damages. If you or your loved one has been injured due to a catastrophic tire failure of another vehicle, you could be entitled to compensation. An experienced, knowledgeable attorney at the Leifer Law Firm can discuss your situation and advise you of what legal options best suit your case. Call us for a consultation at one of our convenient Florida locations today.